MILAN, Italy— Curtiss Motorcycle Company unveiled two new versions of its all-electric Zeus motorcycle in November at the EICMA motorcycle show in Milan, Italy. Set in both Cafe and Bobber configurations, the two new models are slated for production in 2020. They are said to represent an evolved design and technology package based on the company’s newly-formed Advanced Powertrain Division, led by Paul Ogilvie. Curtiss Design Director Jordan Cornille discussed how Zeus’s design has evolved since the concept prototype was unveiled in California earlier in 2018. Curtiss Motorcycles (www.curtissmotorcycles.com) is making an aggressive push into the growing electric motorcycle space. 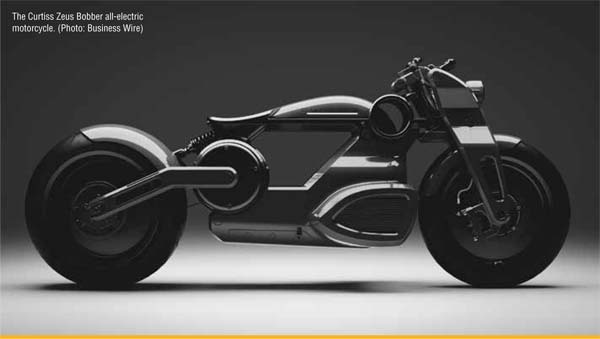 The Birmingham, Alabama-based company expects that its production Zeus models will compete head-on with Harley-Davidson’s upcoming all-electric LiveWire.